Discussion in 'Sports' started by Swami, Apr 11, 2019. F1 heads to Shanghai this weekend for what officially marks the 1000th Grand Prix in history. Ferrari under pressure to respond to their Bahrain reliability woes for Charles Leclerc. Sebastian Vettel set the pace in first practice as Ferrari hinted they could be the team to beat at the Chinese Grand Prix this weekend. 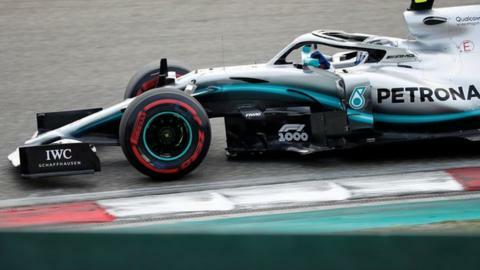 Vettel finished the first session 0.207 seconds ahead of Mercedes' Lewis Hamilton - but the German was running harder tyres which should be slower. Team-mate Charles Leclerc was third ahead of Red Bull's Max Verstappen. 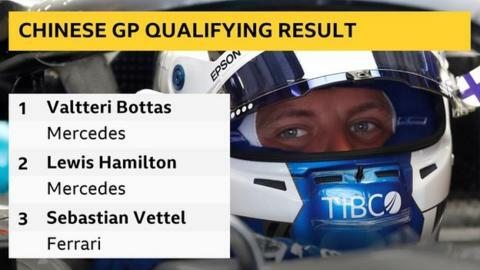 Mercedes' Valtteri Bottas was fifth ahead of Renault's Daniel Ricciardo and Toro Rosso's Pierre Gasly. As in Bahrain two weeks ago, Ferrari's advantage over Mercedes appeared mainly to be on the straights. 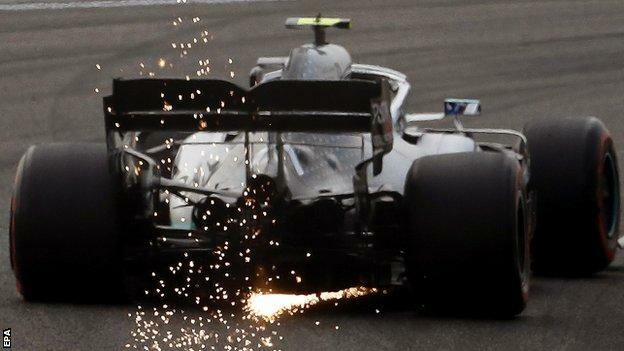 Bottas heads into the weekend as the championship leader, after a win in the season-opening race in Australia and a second behind Hamilton in Bahrain. But Hamilton's win in the desert came against the run of play after Leclerc, who had dominated the weekend, suffered an engine problem in the closing laps. There remains uncertainty about the shape of the competitive picture, after two races of which Mercedes and Ferrari have dominated one each. In theory, there is at least 0.5secs between the tyre compounds, so for Vettel to be 0.2secs quicker than Hamilton despite using a one grade harder tyre appears to bode well for Ferrari. And the internal dynamics at the Italian team are a major talking point - Vettel needs to bounce back in China to protect his position as nominal team leader after Leclerc's impressive performance in Bahrain. The session was relatively incident-free on a sunny day in smoggy Shanghai, although Racing Point's Lance Stroll had a spin out of the final corner early in the session. But the Canadian was an impressive ninth, just behind Toro Rosso's Daniil Kvyat and ahead of the Haas cars of Romain Grosjean and Kevin Magnussen. 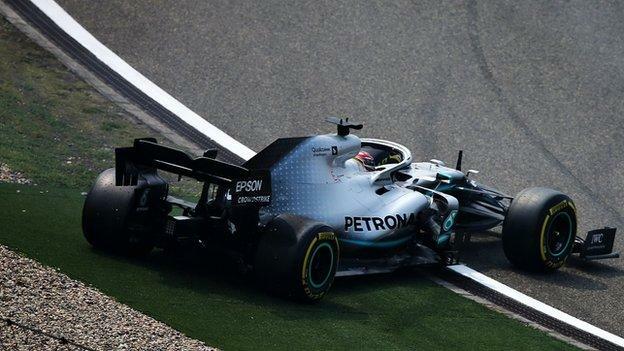 Mercedes driver Valtteri Bottas headed Ferrari's Sebastian Vettel by just 0.027 seconds in second practice at the Chinese Grand Prix. Max Verstappen's Red Bull was third fastest, 0.221secs off the pace despite running wide at the final corner. 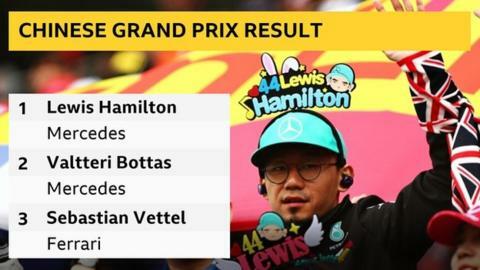 Lewis Hamilton's Mercedes was fourth, 0.707secs off, while Renault's Nico Hulkenberg and McLaren's Carlos Sainz made it five teams in the top six. Ferrari's Charles Leclerc was seventh after problems on his quick laps. Vettel's 0.801secs advantage over his team-mate was exactly what the German needed after the Bahrain Grand Prix, where Leclerc dominated and was on course for a maiden victory before suffering engine problems late in the race. But team boss Mattia Binotto on Friday reiterated that Vettel remained the team's priority, saying: "If there is any 50-50 situation where we need to take a decision, the advantage would have been given to Sebastian simply because Sebastian has got most of the experience with the team in F1." Leclerc aborted his first quick lap on the qualifying simulation runs and when he did finally try again after a number of slow laps he was not able to approach Vettel's pace. Before Bahrain, Ferrari had to run their engine at a lower performance level in the first race in Australia because of unspecified problems. And Ferrari changed the control electronics on their cars for this race to try to prevent a repeat of the short circuit in an injection control unit that caused Leclerc's problems in Bahrain. Teams can use only two control electronics boxes for an entire season, so Ferrari have now used up their allocation. 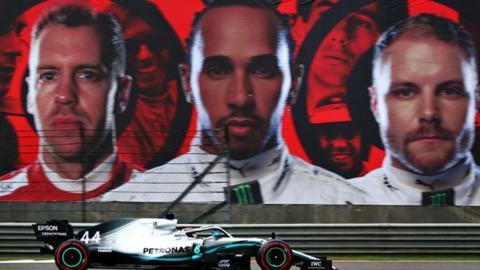 Mercedes felt they were on the back foot after Vettel headed the first practice session, but Bottas was able to usurp the German at the top of the times in the second session, when teams come close to simulating qualifying conditions. And Bottas also appeared to have a slight performance advantage in the race runs later in the session. Hamilton said: "It was quite cold out there, which makes it difficult for the tyres. I was struggling with the car, so we've got work to do, particularly on my side as Valtteri looked much more comfortable. "It is nice to see how close it is between us, Red Bull and Ferrari." Haas driver Romain Grosjean, who was 17th fastest, suffered a front wing failure during the second session, when the right-hand side of the wing broke at the point where the central mandated neutral section meets the outer parts that teams can manipulate for aerodynamic effect. 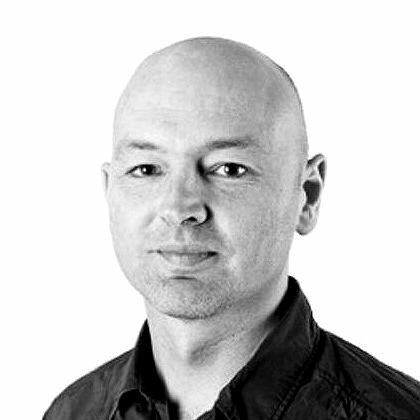 Off track, a number of teams are already running into reliability issues with engines. Renault have fitted updated MGU-K units - the part of the hybrid system that recovers energy from the rear axle - to both factory cars of Nico Hulkenberg and Daniel Ricciardo as well as to the McLaren of Lando Norris, after the other McLaren driver Carlos Sainz had one in Bahrain. This is because of repeated failures in the new design of MGU-K that was introduced for this season. And Toro Rosso's Daniil Kvyat has become the first Honda driver to take new engine parts - he has a new internal combustion engine, turbo, MGU-K and MGU-H (the hybrid part attached to the turbo) after a failure in first practice. Hulkenberg, Ricciardo, Norris, Sainz and Kvyat are as a result likely to run into grid penalties later in the season as each driver is restricted to just three engines, turbos and MGU-Hs and two MGU-Ks and control electronics per season. 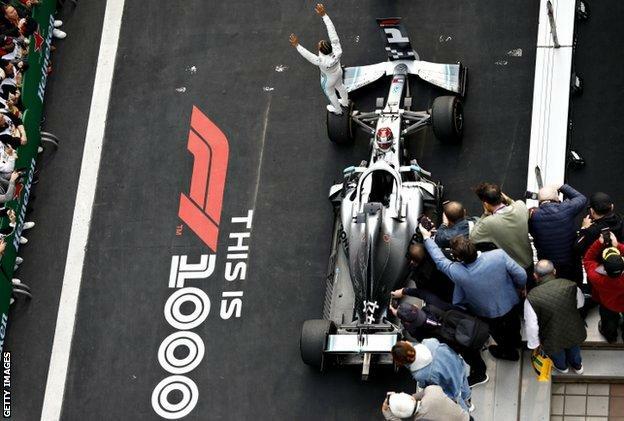 It was Hamilton's 75th career victory, and it came on a weekend on which he had struggled throughout practice but pulled a lap out of the bag to grab a front-row spot, which proved the foundation for his win. The decision was in line with Ferrari's stated policy to favour Vettel in 50-50 situations, as reconfirmed by team boss Mattia Binotto earlier in the weekend. And it was made in an attempt to try to challenge Mercedes. But it triggered a set of circumstances that led to Verstappen beating Leclerc to fourth place. 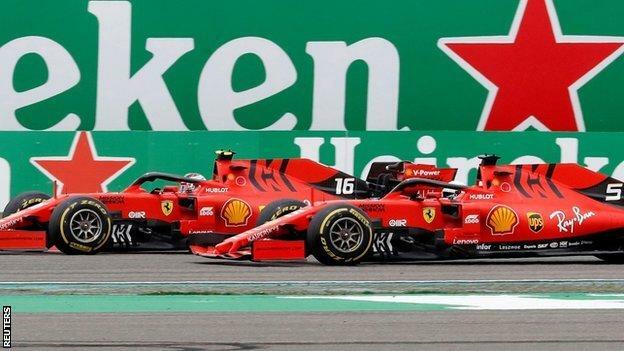 Letting Vettel by cost Leclerc time and ensured Verstappen was closer to him. Vettel was unable to pull away - Leclerc sat just as close to his team leader as the German had to him. And he summed up the situation over the radio by saying: "Now what?" Leclerc said over team radio after giving up a place to his team-mate: "I'm losing quite a lot of time, I don't know if you want to know or not"
Vettel kept third - just - and now Ferrari thought about running Leclerc long to give him a tyre advantage later in the race. He was briefly into second place, but Bottas soon passed him and Vettel and Verstappen began to haul him in. Ferrari eventually pitted Leclerc on lap 42 and he rejoined now 14 seconds behind Verstappen - too much of a gap to make up in the remaining 16 laps. Red Bull's Pierre Gasly took sixth, in a race of his own too slow to keep up with his team-mate and and too fast for everyone else. 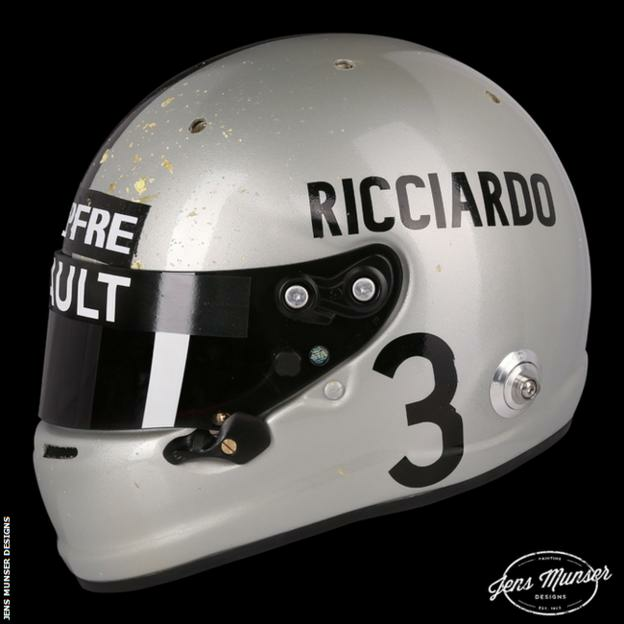 Renault's Daniel Ricciardo took seventh, ahead of Force India's Sergio Perez and Alfa Romeo's Kimi Raikkonen. The final point was taken by Toro Rosso's Alexander Albon, a fine drive after starting from the pit lane in a car rebuilt after his huge accident in final practice on Saturday. Albon had pressure from Haas' Romain Grosjean on the final lap but just managed to hold on. McLaren had a dire day. 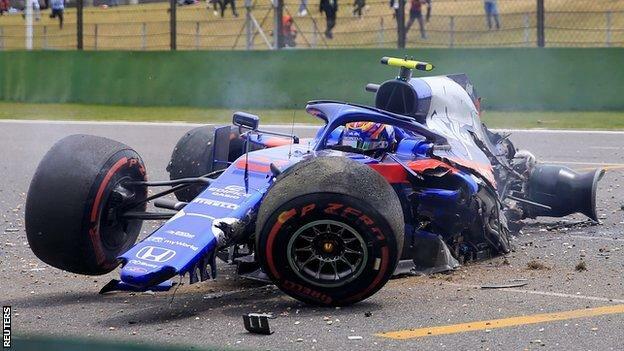 Both cars were hit and damaged by Toro Rosso's Daniil Kvyat on the first lap. Hamilton: "It has not been the most straightforward of weekends but what a fantastic result for the team. "We arrived here not knowing how we would measure against Ferrari - they were so quick in the last race. Valtteri has been quick all weekend and to have a one-two is really special on the 1,000th grand prix. The start was where I could make the difference and after that it is history. "It has been so close between us all and I really have no idea how the next race is going to turn out." Vettel said: "I felt I could go faster but then it was a bit difficult for me to find a rhythm. I had a couple of wobbles where I could not keep the advantage I was getting."